Wash your RV thoroughly. Any mildew that has gotten a start with be out of control by spring. Wash awnings, wheel wells, tires (street side and undercarriage side), and check all your seals (windows, doors, and anywhere else there are seals.) Make sure your RV is completely dry before storing it inside or covering it with a tarp. If you can block your tires, or jack the weight from them, it will help keep flat spots from developing. Your RV has many moving parts, like bearings, that could use lubricating before storing. If you store your RV outside, consider tire covers. Lighter colored covers keep the tires cooler and help to preserve them longer. Check everything for cracks, tears, rust, corrosion, loose connections, or any flaw that can worsen while in storage. Fix it now. Your tarp should be “breathable” so that moisture doesn’t condense beneath it. Moisture can rust or corrode RV parts. It also allows mold to grow, and some, like black mold, can be deadly if inhaled. Moisture can accumulate inside your RV when it’s closed up for months. Again, mold can be deadly, but even when not, it can destroy the interior of your RV. Moisture alone can do its own degree of damage. Setting a container or two of Dri-Z-Air, Damp Rid, or silica gel should be sufficient. Alternatively, you can run a dehumidifier, but that means running an electric appliance, unsupervised except for periodic checks, for several months. Mouse-proofing goes beyond just mice but includes keeping any animals, insects, or reptiles from moving into your RV. Inspect the entire outside of your RV for any cracks, holes or openings that a mouse can fit through. If you can get your finger inside an opening, a mouse can get his body inside. Obviously, insects could enter through those openings, as well as snakes. Squirrels, like mice, are very destructive. Given a starting point, they’re very clever at enlarging an opening to gain access. Any of these critters will tear up carpets, furniture, and curtains, and some will chew up cabinetry and more. All of them will leave excrement everywhere. Preventing them from getting in is easier and cheaper than cleaning up after them and making repairs. Fill outside holes with brass or aluminum wool. It won’t rust away the way steel wool will, and will block the opening. You can use a foam insulation material, like Great Stuff™ to fill smaller holes and cracks. Don’t leave any way for these invaders to crawl up inside your RV. Place insect traps, ant bait and mouse traps near your tires, hitch blocks (trailers), or any part of your RV that contacts the ground. Place them on the roof if there’s a chance that squirrels, insects, mice or other vermin can drop from a ceiling or overhead trees. Wasps, mud daubers, bees, and spiders seem to be attracted to propane, or at least its smell. Venting all propane lines will help keep them from settling into your RV. Do check periodically for nests, hives, or other indications of their presence. Seal off the stove burners, pilot light and other areas where the scent of propane may linger, too. Make sure your vents are closed tightly and that nothing can enter through them or your air conditioner. If you’re storing your RV inside, removing your propane tanks is a good safety practice. You can find caps for propane lines at a hardware store. These will keep your lines clean, and keep insects and dirt out of them. Store your propane tanks in well-ventilated areas, and so that they don’t rust or become damaged. Remove all food from your refrigerator and cupboards. A few cracker crumbs might be tempting enough for an undesirable to break through your carefully constructed barriers. Once they’re in, they multiply. Defrost and clean your refrigerator thoroughly, and cupboards as well. Leave only canned foods that are undented and will still be well within their expiration dates when you are ready to take your RV out of storage. Prop the doors open to keep the inside fresh smelling. Prop the cabinet doors open as well to discourage nesting. Remember to check items like deodorant, lotions, shampoos, toothpaste, medicines, and other things stored in the bathroom or cupboards. These, too, will deteriorate and do have expiration dates. But they can also attract rodents and insects. And, while not a perishable, tissue and paper towels, even rags, are useful to animals for making nests. Take them home and use them. Don’t give critters any reason to feel at home. Clean your RV thoroughly before storing it, giving special attention to removing food from tables, under cushions, carpets, and crevices. Use bleach where safe, as this kills bacteria, fungus, and viruses. What bleach odor remains may help deter wildlife invaders. 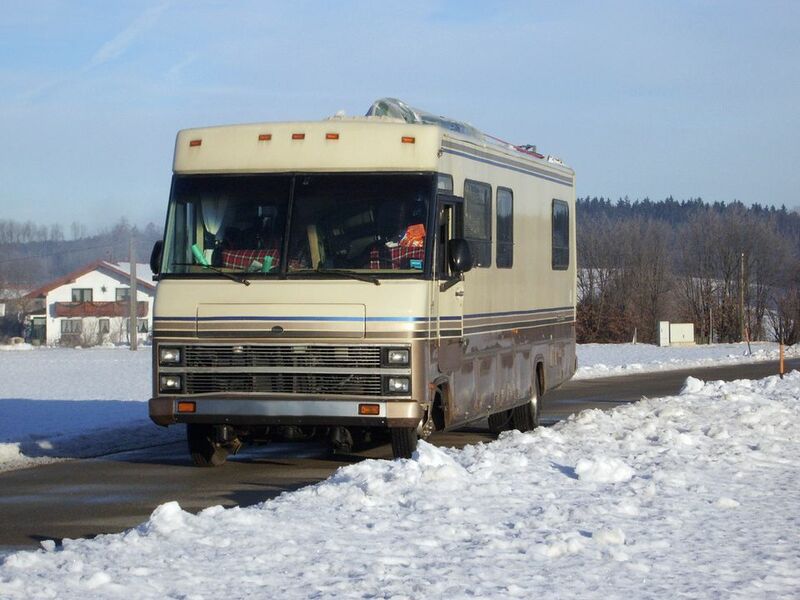 Don’t leave anything of value in the RV while it’s stored, even if on your property. Not only is it a temptation for thieves, but some things don’t weather well, like TV screens Other electronics may also succumb to temperature extremes. Don’t forget to check your RV periodically. Go inside and inspect every nook and cranny, and do the same outside. The sooner you spot a problem the easier to stop it and repair any damage. Once your RV is prepped and ready for winter storage, keep in mind that you'll have to undo much of the work to get it ready for use again. It's most important to flush the RV's water system after storage. And be sure to check the electrical system before you go camping.